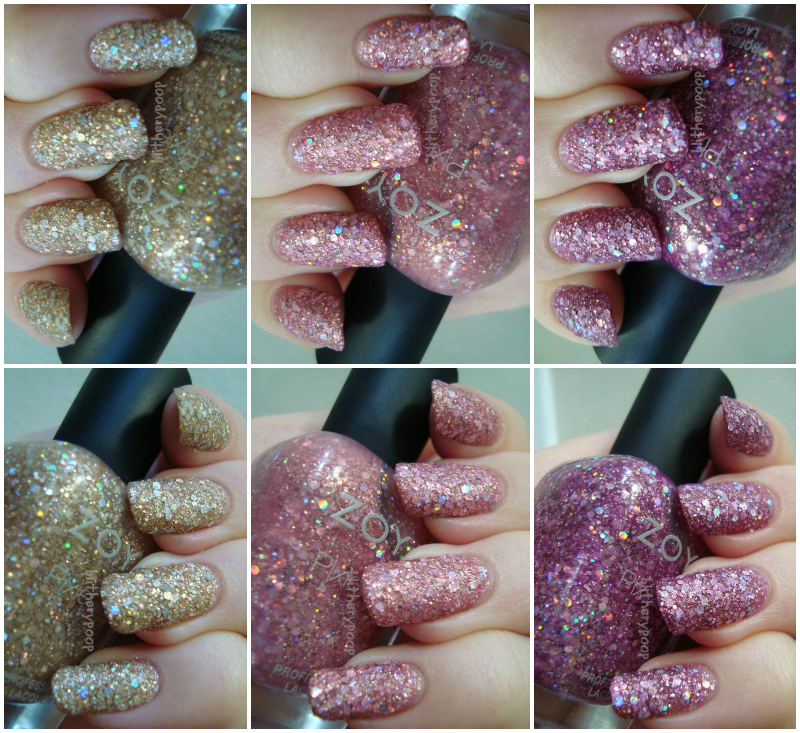 Zoya released their first set of Magical Pixie textures in the spring and they're back for summer with three more. Their other two summer collections, Tickled and Bubbly, are tropical brights but they toned the color palette down for these glittery textures. All three shades have a mix of silver holographic glitter and silver fleck shimmer in a sheer base and take a little practice to apply. They're thick and a bit gooey, but the base settles in over the glitter as they dry. They're quite rough once they're dry. I didn't topcoat them this time, since I don't think it makes as much difference to their appearance as it does for the...uh...non-Magical (muggle?) 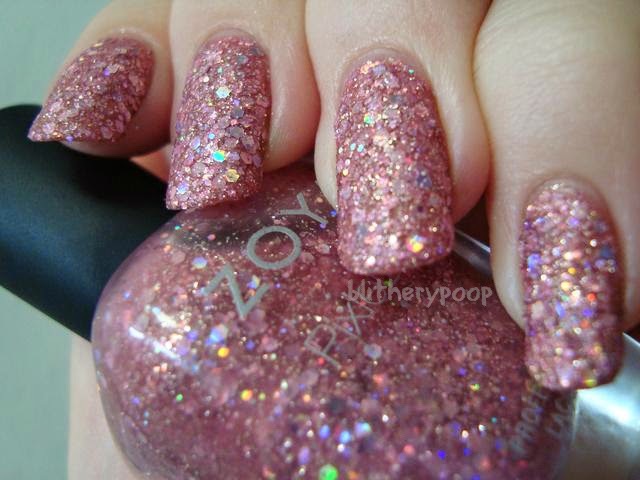 Pixie Dust shades. Bar has a yellow-toned tan base. I started off with two coats of Bar. Two isn't enough to cover my nail line and the color is unflattering on me. I'm not sure if it's my skin tone or the yellow staining of my nails, but something here really doesn't work! I added a third coat to see if it was better. Honestly, I'm not sure. You can't see my nail line as much this way, but Bar and I just don't jive. It happens. Ginni's base is a soft rose. Two coats were too sheer this time, so I just went right to three. The base color is decidedly more flattering this time, though if you read us often...well...you know how I feel about pink. It's decidedly pinker than spring's Lux, deeper and rosier than Lux's soft blush pink. Arlo has a red-violet base. Instead of doing three coats for Arlo, I tried two thick ones. I think it works better. The color surprised me once Arlo was on my nails. It's not as pink as I'd expected. The base has more depth to it, which I think really adds something to the look. Of the three, I liked Arlo the most...surprise surprise, right? Bottom line: Arlo is pretty, Ginni is ok, and Bar looked terrible on me. I found myself wishing several times that they'd done textured versions of Muse, Stassi, and Jesi from the Bubbly collection instead. So now that six have been released, what do you guys think of the Magical Pixies? Do you think they'll do three more for fall? I don't understand why they keep doing such blah colors in these. So unimpressive. I like the regular pixie dusts so much better. I hope they do a bright summer collection of those again. Arlo is the most interesting but not enough that I want to buy it.